Maritime Vinyl: Sly and the Family Stone's Fresh - revisiting a classic! 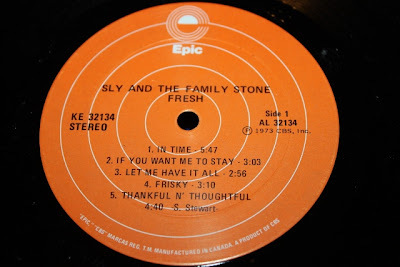 Sly and the Family Stone's Fresh - revisiting a classic! I always keep my eyes open for funk albums when I am crate digging. It’s a far stretch from the punk rock, rap rock, classic rock and jazz I often talk about on Maritime Vinyl but it holds its own as one of my favorite genres of music. Besides the obvious catchy rhythm section, the various styles of playing all of the instruments that requires such feeling and talent is incredible and it could only work together as one in a funk band. It always keeps me wanting more. 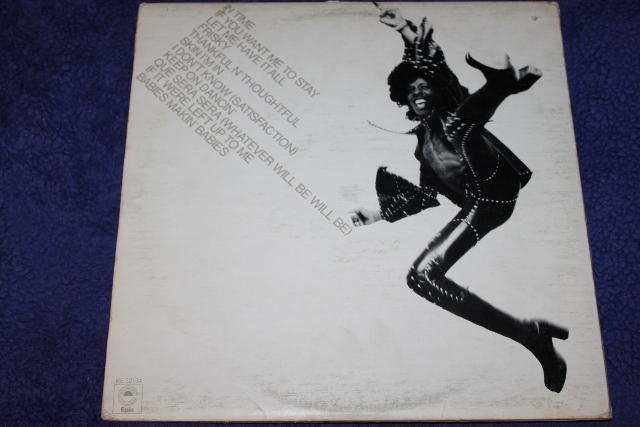 At the top of many lists of greatest funk bands sits Sly and the Family Stone. Their greatest hits album has had heavy play time on my turntable over the past few years giving me my Sly fix while I’ve been patiently waiting to score more albums. I lucked out recently and found a nice copy of Fresh. Just going by the influence this album has been known to have on so many great artists would gave me enough reason to buy it, but in reality, I would have bought it just for the cover alone. 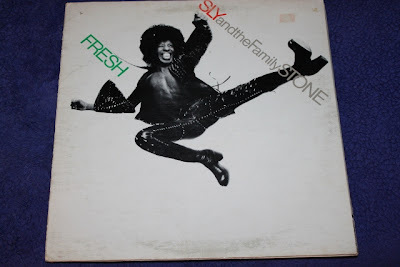 Fresh was Sly and the Family Stones sixth album. All songs except one (Qué Será, Será ) were written, arranged and produced by Sly Stone himself. 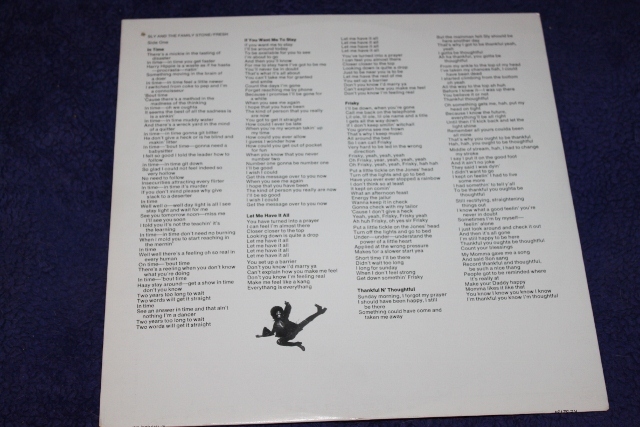 Fresh was released after the greatest hits album I own so all of these songs were new to me. Sly was more heavily involved in this album than prior albums doing most of the work himself. This was mainly caused by tension between the band members as well as some new members being introduced. The main shuffle was in the rhythm section which is of course critical in a funk band. This is the first Sly and the Family Stone album without original bass player Larry Graham playing on the entire album. Larry is credited by some as inventing the slap bass technique on the electric bass. This slap bass technique has become heavily associated with the funk music genre. 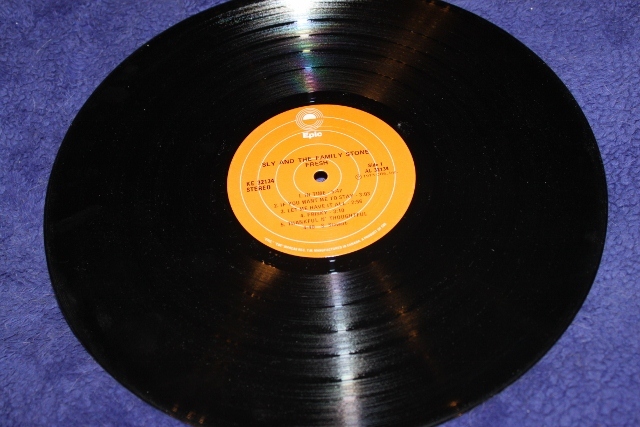 Larry was replaced in the Family Stone by nineteen year old Rusty Allen during the recording of this album. Rusty plays bass on the songs In Time, Let Me Have it All, and Keep On Dancin while Larry Graham plays bass on Que Sera, Sera and If It Were Left Up To Me. Sly handles the bass on the remainder of the songs. Drummer changes were also frequent in the Family Stone and Fresh was the first album for drummer Andy Newmark. This rhythm section shuffle really worked well for this album and gave it a unique sound opposed to the previous albums. If You Want Me to Stay was the biggest hit from this album becoming the last Sly and the Family Stone song to ever hit the top 20. Other notable are Frisky and Qué Será, Será (which is the only cover song ever released on an original Sly and the Family Stone album). I'd have a hard time choosing any one track as a favorite, the entire album works so well together. I want it all. Sadly the new rhythm section is not all that can be attributed with the new sound, some of this would have to do with Sly and The Family Stone being heavily addicted to drugs. While the drugs didn’t yet seem to be affecting their musical ability, it came soon enough as this was the last album that reached this level of success. I guess it’s not my place to say that it was even the drugs that caused their decline, but this sure seemed to be the turning point. Hard to say how productive Sly could have been had he not dabbled in drug. The last time I saw him in the news headlines it was reported that he was homeless and living in a van. Sad. Fresh is noticeably darker than their greatest hits album that I am used to. After further reading I guess Fresh is considered much more upbeat and brighter than the previous release There’s a Riot Going On. This darker style of funk is a welcome change to me; I’m looking forward to hearing Riot now.